If Friday was a story of two teams in utterly contrasting form - one promenading to a monstrous 570-9, the other staggering to 35-1 - it was also a tale of two skippers, one on top of the world, the other staring into a very big hole indeed. Michael Clarke and Alastair Cook have much in common. They are both in their 99th Test, both locked on 25 Test centuries apiece before this match began, both men who responded to being made captain with a pile of follow-my-lead runs. This second day in Adelaide drove a green and gold bus between them. Clarke, with his shuffle-shoed, fast-twitch 148, took Australia out of reach; Cook, stone-legged in his brief 11-ball stay, lost his off-stump to Mitchell Johnson and with it possibly both Test and series. Sydney boy Clarke flourishes on the dry south Australian clay like no other. This was his sixth century at this ground, his nine Test appearances here combining for an Adelaide Oval average of 104.75. Michael Clarke has now scored more Test runs in Australia (4,418) than Don Bradman (4,322). If there was genuine surprise when he fell short of his third consecutive double-century here, there was consolation not only on the scoreboard but in the record-books. Sir Donald Bradman, this city's most famous adopted son, is the only man with at least 10 innings under his belt to surpass Clarke's average on this famous old ground with 107.77 - not a bad close second for a skipper wearing baggy green. Such performances from the kingpin change series. Three years ago, then-Australia captain Ricky Ponting was neutered to such an emasculating effect that his paltry 113 runs across his eight innings came at an average of just 16. England, with those record-breaking three innings victories, were able to take total control. Clarke has had luck this fortnight. Winning the toss on this pitch has been even more important than doing the same in Brisbane. But he has begun these Ashes by not just orchestrating the Aussie assault but leading it from the front. Already he has two tons in three innings, his average of 87 a monstrous 60 runs better than that of Cook. Neither is this out of captaincy character. As a foot soldier in the national ranks he averaged 46 in Test cricket; since his promotion to the top, he is going along at 64. How has he done it? And what can England do to prevent him carrying on the carnage in the matches that remain? "One thinks of great Australian players as being great back foot players, but that obscures the reality that most of their great players have been very good on the front foot defensively and then go back to attack," says Simon Hughes, analyst in Adelaide for Test Match Special. "That is the basis of Clarke's success, just as it was for Ponting, Allan Border and Steve Waugh, three of their most prolific batsman. "What he's also very good at, much like Ian Bell, is that he's got great touch. As well as those good foot movements he's got lovely feel, so he can play little dab shots and little flicks off his hips, with those strong wrists of his. "It means he has a range of shots and a wide range of scoring. He doesn't have to be brutal. Like Bell, he caresses it." Clarke was at his balletic best against the spin of Monty Panesar and Graeme Swann. While Swann endured more punishment from the bellicose Brad Haddin and Ryan Harris - his two wickets off 36 overs cost 151 runs - Panesar was tormented by Clarke's ability to skip out to fuller balls and dance back to cut and dab away the shorter ones. "Against faster bowling he gets forward and looks to score primarily off the front foot," says Hughes. "Against spin, he's very nimble. He picks the length up earlier than anyone else. "He's looking to get down the pitch at the earliest opportunity. The first ball Panesar bowled on the second day, he came down the pitch looking to hit the ball over the top. It's the attitude as much as anything. "When he comes down the pitch, he's not necessarily looking to whack it. He's looking to place it. So he gets down the track and just works it into a gap, and gets his body and momentum closer to the ball. It disrupts the bowler's length, and allows him to work the ball into gaps." "Quite simply, England are struggling. They are dropping catches, missing chances and are miles behind Australia in terms of performance, energy and aggression. "England had the opportunity to get in this game with some early wickets, but that was snuffed out by the brilliance of Australia, who were ruthless, adventurous and positive - all the things that England haven't been." Panesar's figures of 1-157 off a wearying 44 overs reflected his lengthy absence from Ashes cricket down under as well Clarke's dominance. But Swann's travails on a pitch where he took seven wickets in the match three years ago are of still deeper concern to England. When Swann threatens, England can be both aggressive and attritional. When he struggles, their attack loses critical balance. "Australian batsmen have often had a problem against off-spin," says Hughes. "On one tour here, England brought three of them. "Against Swann, most batsmen will look to hit the ball predominantly one side of the wicket. Rahul Dravid would try to hit him through the off side, against the spin, because there were fewer fielders on that side. Hashim Amla and Jacques Kallis look to get over to the off side and work him to leg. "Clarke can do both. He can flick him to leg, but he can also get inside the line, open the face of the bat and because of his wrists, hit the ball through the off side." His weakness? In the corresponding fixture here on England's previous tour he made just two in the first innings, in a series when he averaged just 22 and failed to score a single century. "James Anderson bowled very well against him three years ago," says Hughes. "He reversed it a lot, and he tempted him outside off stump. He got him to nibble and got him out, which is why he has had more success against him than anyone else. 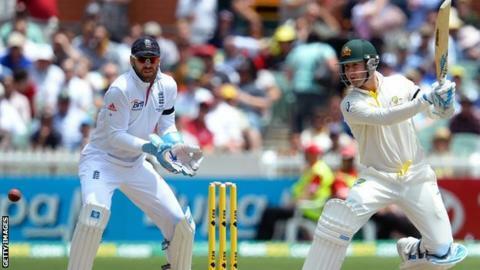 "Stuart Broad also unearthed a slight weakness in Clarke, which is that he tends to stand up and play the bouncer. He's not very good at ducking, which has meant that Broad has got him out a few times with his height." Such tactics will be tried again on the far bouncier track expected in Perth. But by then too much damage may already have been done. England have won at the Waca only once in Test history, and that against an Australian side weakened by World Series withdrawals. If they capitulate in this second Test as feebly as they did in the first, the Ashes may be gone before Christmas has arrived, the stuffing of the turkeys a headline that the jingoistic Australian tabloids will be only too happy to write.